We’ve got you covered when it comes to phones that look smart and act smart. iPhones®, to Androids® and even Windows® phones have a spot in anyones heart, and we’ve got the variety to help you find your perfect match. If you’re looking for phone that has a few tricks up it’s sleeves but can wow even the toughest critic, we got your back. These phones can get you talking and texting with your friends and family in not time without all the flashy menus. 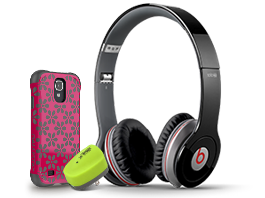 Show the world your style with a rockin new protective case or just vibe to a good beat with a great selection of headphones and speakers. Great choices from great companies, great quality from great designers. With over 4.6 Million customers and counting That's a lot of friends... , Cricket is the right choice for you! Simply put, its the most complete and trusted We Love Our Customers! cellular provider on the market. AA Service Group’s mission is to become a market leader by consistently exceeding our Customer’s expectations; providing them with best cellular solutions. We will continually communicate with, and learn from our Customers, in order to improve our products and services. And, we will keep on top of today’s and tommorrow’s technology, no matter how fast it moves, to ensure our Customers always have the best tools available to them. Through the loyalty of our customers, and the extra mile our employees go each and every day. AA Service Group continues to grow, and is proud to be among the largest Cricket Wireless Dealers in the NW, and the best in customer service. It is our belief that no problem is too great to solve, and that each and every customer is a part of our family. AA Service Group has been a leader in the cell phone industry for years not just in the Portland area or even the Oregon area, but nationwide. We promise to continue to bring the best customer service experience any customer will find for years to come. With easy activation, great devices, and a service that works hard for you, Cricket Wireless is what you’ve been waiting for. With Cricket Wireless you get a first-class nationwide wireless experience at a price that fits your life – without any annual contract. 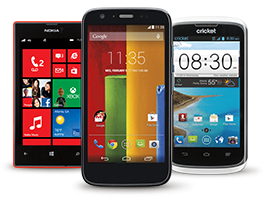 Shop for the latest iPhones, Android phones, and smartphones from Nokia and ZTE. Love your current phone? No problem! You can add it to the Cricket network. Stay connected with Cricket’s reliable nationwide network and fast 4G LTE speeds. Our simple, straightforward monthly prepaid phone plans include mobile data access and unlimited talk and messaging. Cricket is all about you. Start experiencing the power of Cricket today. 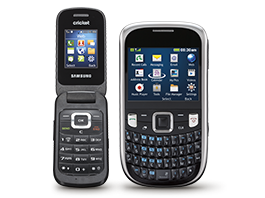 Shop now for the cell phones you’ll love and the plans that will save you money. Over 4,600,000 Friends, Let’s See What Some Have To Say? We love our customers Yep, we certainly do! , and are fully dedicated to keeping their trust. When you choose Cricket, you won’t ever have to worry We strive to please our users about customer support! I’ve been a Cricket customer for years, probably since the birth of Cricket. Over the years I’ve seen this company go from good customer support to epic customer support. Five star customer review from this guy. The team at Hall went above and beyond to help me move over to the new GSM network. I was more than happy when I found I finally had service way out in the boonies. Thank you team Hall! Mike was extremely patient. He listened to my concerns and then offered a solution that gave me a choice of products so that “my buy” decision was “my decision” to purchase and not something I was sold. For years I’ve always wanted a Galaxy S5 but they were always too expensive. The rep at the St Johns store helped me finance the phone of my dreams and hooked me up with perfect case even I could afford. AA Service Group brings the thunder with 26 amazing Oregon, Washington & California Locations, come see what the New Cricket has to offer!